Much like 2nd edition, we have separate charts for each hit location, which contain increasingly gruesome effects for the recipient. Now in 2nd edition the lookup was offset based on how many wounds below 0 you went, thus the harder the hit, the worse the effect. In this case we have a straight d100 roll for the effect with no modifiers, and it’s easy to miss that this is actually a significant change. Also the new chart adds an extra column labeled simply “wounds”, which indicates extra damage you take for rolling that critical. This column is also easy to gloss over, but is actually indicative of the weird double-duty this chart is doing. In 2nd edition, wounds were ultimately a buffer between you and the critical chart. Once you went below zero you started taking critical wounds. The chart itself is what would take you out of combat – a light critical may just damage your armor or daze you, meaning you’re still in the fight. Of course, the amount of damage below 0 any hit takes you is applied as a bonus to the roll on the chart, so once you’re at 0 wounds you’re in big danger of having the next hit roll much higher on the chart. Possible outcomes included KOs, maiming, or even death. Ultimately this is how you got knocked out of combat — the charts either incapacitated or killed you, otherwise you’re still in the fight. In 4th edition, there’s a whole separate thing involving the “Prone” condition, which you cannot remove if you’re at or below 0 wounds, unless you spend rare resolve points to do so. When prone, all you can do is crawl around at half movement and enemies can easily kill you. This makes the new edition pretty good at representing that case of getting so badly beaten you just can’t lift yourself off the ground, without it necessarily being a character ending event. Maybe your allies still prevail, and can carry your beaten limp form off for recuperation. So when do we use the critical charts? Two cases, it turns out. First is similar to the old 2nd edition use – if you get hit so hard you should go below 0 wounds, you have to roll on the chart in addition to getting an unremovable Prone condition. The latter point is important – prone comes in if you go to 0 or less, but if it’s less you also get kicked in the teeth (possibly quite literally, I wouldn’t be surprised if there wasn’t a “lose d6 teeth” entry on that chart somewhere). The critical could be bad enough to kill you immediately, or add conditions like “bleeding” that might eventually kill you, or it could be mild and not worse than the unrecoverable prone condition. When you receive a Critical Wound, you do not determine the struck location by reversing your roll. Instead, you roll 1d100 again and refer to Determine Hit Location(see page 159), then roll another 1d100 and refer to the appropriate Critical Table to determine what has happened. You suffer the number of Wounds indicated, not modified by Toughness Bonus or Armour Points, though these will never trigger a second Critical Wound. Further, you suffer any Additional Effects noted. 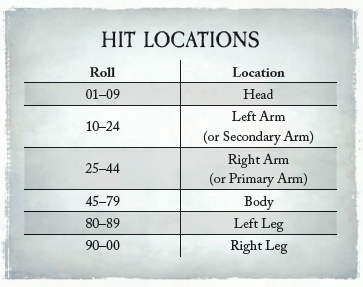 Normally for hit location you invert your attack die roll, so if you rolled a 37 and hit your opponent, you look up 73 on the chart above – it’s a hit to the body. The inversion is nice because it doesn’t mean that head shots are more common. A raw roll on this chart would result in about a 10% chance of hitting someone in the head, but if I only had a 10% chance to hit in the first place, not inverting the numbers would mean that I would only ever hit my opponents in the head. Inverting the rolls 01-10 better mimics the probabilities, as I only get a head-shot 10% of the time on a roll of 10. 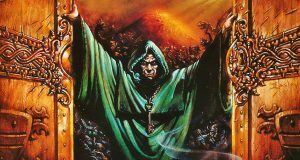 This rule has been around in Warhammer forever, and I rather like it as it reduces the total number of rolls in any given attack. So why do we re-roll the dice when a critical is scored? I suspect it’s for handling the doubles-based critical hit. In that case, it would be impossible to critical someone in the head, because there is no roll of doubles that results in a value from 01-09. However, I find it really counter-intuitive to re-roll the location in the other case, when the critical results from taking enough damage to bring you to less than zero wounds. In that case we can’t possibly adjudicate if the critical happened or not until we’ve had some outcome based on the location. Eg, if I have 1 wound, 3 toughness, and a skull cap (1 armor point) on my head and take 5 wounds, location is very important. A hit to the head means no critical, as my armor makes the damage take me to exactly zero, while a hit to the arm would result in going to -1 and thus result in a critical. But then the rules tell us to re-roll the location, and what if that roll comes up head? We can’t move where the damage is because it would negate the critical. So I guess I got hit in the arm, started to fall, then got bashed in the face for good measure? This annoys me so much I’m kind of inclined to house-rule it, and say you only re-roll the location on the doubles kind of critical, or perhaps more correctly: you only re-roll the location if damage has not been allocated prior to determining that it’s a critical wound. Remember that wounds column in the critical chart? It turns out that column is only meaningful for the doubles case of critical wounds. If I received my critical wound because I went below zero, and taking extra damage can’t cause a second critical wound, then the extra damage is moot. So, ultimately, between my desire to house-rule the bit about re-rolling location (which I’ll remind you is in the header of these tables), and this column that’s only pertinent for critical hits made by rolling doubles, what we have here is a table that’s trying really hard to handle two totally different systems, and do so quite poorly. 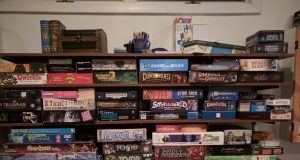 Ultimately I think I know what I want here, and I know how to rule it at the table, and I do ultimately like how it makes combat feel. So this seems to me a prime example of my overall impression of 4th edition: really nice rules that have been very poorly organized.